The first thing that struck me about this show was the sheer level of energy. Our two performers were utterly fearless and, after a slightly wayward Fringe weekend on my own part, rather more than a little intimidating. Initially, the tsunami of said performance energy made it hard to warm to ‘Cassandra Hunt’ & ‘Cynthia Murphy,’ but I eventually started to relax into things, albeit with the ever-present fear they were going to rope me into one of their skits. 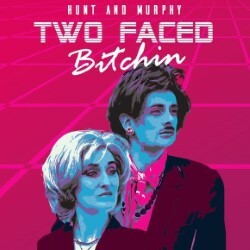 Two Faced Bitchin’ is essentially a sketch show with several different double acts all played out by the same two performers; with the common thread of a home shopping channel they kept returning to. My personal favorite was the Victorian Revivalist pair consisting of a man in a period dress and a woman in some kind of lace burka and a mouth-guard that made most of her speech incomprehensible. They were certainly very skilled and confident performers, with my main reservations coming from the material which at times seemed a little bit on-the-nose and excessively silly. However, it was when this silliness exploded into the downright surreal, slightly embarrassing and somewhat disturbing that I felt the show was at it’s best, & it was in these moments that the few personal belly laughs I did churn up came gushing forth. Not to say that the rest of the audience didn’t seem to be enjoying themselves. Everybody seemed to be having a whale of a time and it was in the aforementioned more peculiar moments that I seemed to be the only one laughing. Maybe the fault was not with the performers but with my own warped sense of humor. I guess that’s just the kind of guy I am & what I’m saying is, if you’re going to do silly go all-out and make no attempt to water it down with any kind of logic or narrative thread. But then, judging by the audience reaction, that is not the prevailing opinion. In conclusion, my advice is to go and see this show, & you will probably love it, & it’s also nice to see someone punting a little bit of vinyl for a change.